For the dressing, add the chillies, garlic and shallot to a pan with the olive oil. Heat the contents of the pan to just before it starts to sizzle and remove from heat and leave to cool. Drain the ingredients from the oil and finely chop. Return the ingredients to the oil along with the finely chopped herbs and mix well, season and set aside. This can be made in advance. 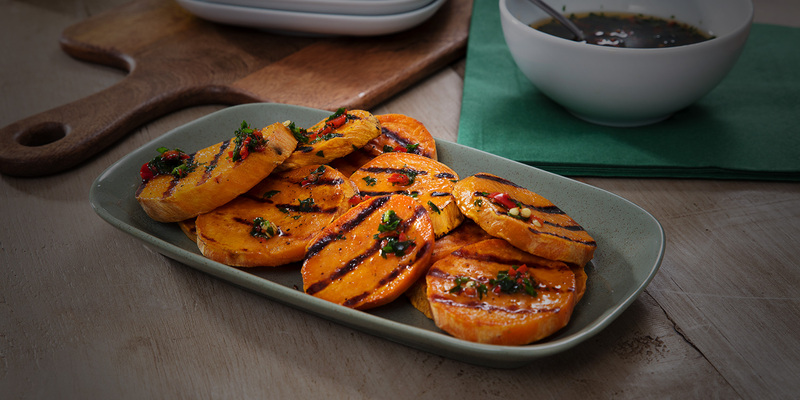 For the sweet potatoes, pre heat the Stainless Steel grill. Peel and slice the potatoes into thick circles. Brush with the olive oil and season. Place the potato circles on the grill and cook for 10-15 minutes or until soft. Once the potatoes are cooked place on a plate and spoon the dressing over the top and serve.